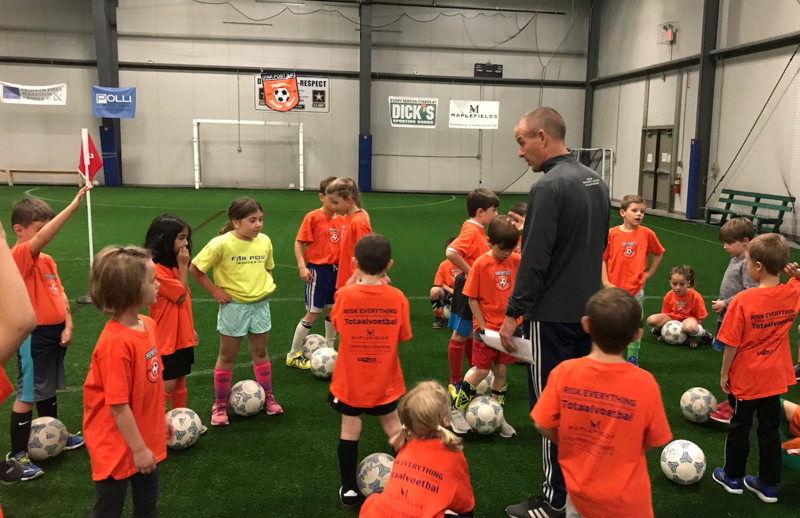 Indoor Options | Far Post Soccer Club, Inc.
Far Post offers a number of different programs over the winter months for players aged 4-15 regardless of which club you play for. You will find a breakdown of the different offerings by age below. All programs are run at our indoor facility at the Robert E. Miller - North Center at the Champlain Valley Exposition in Essex Junction. Programs are split into 3 sessions: Session 1 (Nov-Dec), Session 2 (Jan-Feb), and Session 3 (late Feb-early April). We are now accepting registrations for Indoor Session 3 (below)! The theme: Finishing. FP Juniors (2013-2014 Birth Years): For our youngest players (ages 4-6). This program has an emphasis on building skills and a love for the game through fun games. Led by Club Director Todd Kingsbury, the Juniors meet once a week. Thursdays, 4-5pm - Mar. 7, 14, 21, 28, Apr. 11 - Click to Sign Up! U8 Program (2011-2012 Birth Years): Our U8 Program continues to focus on building technical skills while introducing larger soccer concepts in small-sided game settings. The U8's meet Tuesday/Thursday from 4-5pm. Tues/Thurs, 4-5pm - Mar. 5, 7, 12, 14, 19, 21, 26, 28, Apr. 2, 9, 11 - Click to Sign Up! U10 Excellence (2009-2012 Birth Years): Our U10 Excellence Program meets once a week and has a different focus each of the three sessions. Players are pushed to continue to hone their technical skills, but now under pressure in 1v1, 2v1, and 3v2 situations. Boys Jr. Academy (2005-2008 Birth Years): For boys U11-14, the Jr. Academy is the perfect opportunity to fine-tune your skills in a supportive yet demanding environment. Each of our 3 winter sessions focuses on a different topic, from passing/receiving to small-group attacking to finishing. Wednesdays, 6:30-7:30pm - Mar. 6, 13, 20, 27, Apr. 3, 10 - Click to Sign Up! Girls Jr. Academy (2005-2008 Birth Years): Same emphasis as the Boys Jr. Academy, but a girls only offering. Mondays, 5-6pm - Mar. 11, 18, 25, Apr. 1, 8, 15 - Click to Sign Up! Want to make sure you don't miss out on next sessions sign-up? Sign up for our Newsletter here! Session 1: Ball Mastery & 1v1 skills. Session 2: Possession with a purpose. We work on passing and receiving, as well as basic possession concepts. Session 3: Finishing. Developing that scoring touch!